Save time and reduce man-hours where there are no docks. Pit or surface mount with the optional approach ramp. Engineered and designed for maximum safety and efficiency. Checkered plate deck is made of heavy gauge steel for years of use. Hydraulic cylinders feature emergency velocity fuse if line breaks. Complete with upper travel limit switch and overload relief valve. Push-button control is 24V AC on a 20 foot long coil cord. Pre-wired control box includes magnetic starter and overload fuse. 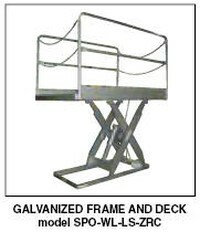 High visibility removable handrails with fixed toe-boards are standard. Includes beveled toe-guards and electric toe-guards around perimeter of platform. External 6.5 HP 208-230/460V, 3-phase, 60 Hz motor may be located up to 8 feet away from lift. OSHA and ANSI compliant. 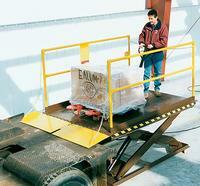 The electric toe-guard is a patented feature essential to the safety of personnel. The guard is made from L-shaped aluminum extrusion and hangs below the entire perimeter of the deck. If the Scissor Dock is being lowered while an object such as a person’s hand or foot is in its path, the guard will be triggered and electrically stop the table from lowering. Once the object is removed, the table will once again be operable; there is no need to reset the unit. Without toe-guard provisions, scissor tables do not meet OSHA or ANSI standards and are extremely dangerous to operate. 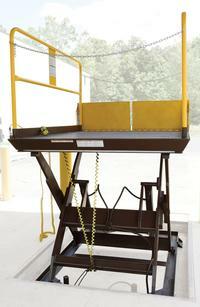 Model V-WL-AR-8 - APPROACH RAMP FOR 8" LOWERED HEIGHT LIFTS: 60" wide x 65" long. 7° . Model V-WL-SATB - SPLIT ALUMINUM TRUCK BRIDGE: Standard steel bridge can be replaced with an aluminum bridge 72" wide x 18" long. Ideal for government applications. Model V-WL-SSTB - SPLIT STEEL BRIDGE: An additional split steel bridge can be added to opposite side of unit. 72" wide x 18" long. Model V-WL-RHT - REMOVABLE HANDRAILS/TOEBOARDS: When mounting this lift in a pit, this option allows platform to be flush with the floor for fork truck cross traffic. Deduct 71⁄2" from overall width for usable width. Model V-WL-50 - 50,000 lbs. ROLLOVER CAPACITY (25,000 lbs. per axle): Add'l structural channel and supports for deck. Increases lowered height 2".